Confessions of a 20-something Scrapbooking Mother: Card I made this morning! 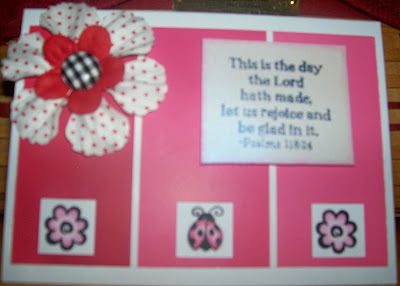 Very pretty card - I love the little stamps at the bottom - especially the ladybug! Very cute card! I love the paint strips and your little ladybugs. I love using colored pencils! I bet GG will love it. I really, really love the stamp! Great card. I haven't tried the paint chip card thing yet, but I plan to. Such a pretty card! She'll love it!